Methodism began in Frederick over 200 years ago, when, in 1770, Robert Strawbridge accepted an invitation from Edward Drumgole to conduct a Methodist service for a small group of friends. Under Strawbridge’s magnetic leadership, Drumgole began to preach and he formed the first Methodist Society in 1772. For twenty years, the congregation worshipped in private homes. In 1792, they secured their first regular house of worship, located on West Church Street. The church was erected on a lot conveyed by Lenox Martin, an attorney-at-law. It was twenty by thirty feet in dimension and one story high. There was no floor and it was furnished only with rude benches. 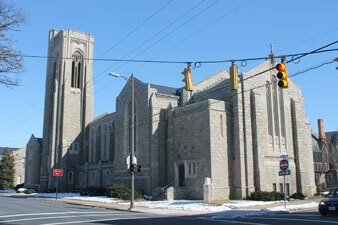 This original structure was enlarged numerous times to meet the needs of a growing congregation, but was finally sold. In 1841, a new church building was erected on East Church Street. By the year 1865, the membership had again outgrown its facilities. The building was completely removed and a new one was put in its place. In 1910, additional land was purchased and the church extensively remodeled. The congregration worshipped here until 1925, when, due to the steady increase in membership, it again became apparent that the church was too small. The church assumed title to the land upon which the present edifice stands on April 1, 1928. The cornerstone was laid on May 29, 1929 and the dedication held on September 14, 1930. Today, Calvary United Methodist Church stands in the heart of the community. Its stately gothic structure, its beautiful glass windows and its open doors are a reminder and invitation for all to worship God.